Nov 4, 2011 – Murray Park, on the south bank of the Arkansas River in Little Rock, offered many sights when Eric Sundell led two groups of native plant enthusiasts on walks there during the fall meeting of the Arkansas Native Plant Society. Six people joined Sundell, a botanist and president-elect of the society, on the morning walk on October 1; 13 met him for the afternoon stroll. An osprey (Pandion haliaetus) appeared for one group and Pam and Jack Stewart and Bill and Devon Hollimon identified it. Sundell compiled the following list of species with observations that he and the other hikers made. Aster, annual (Symphyotrichum subulatus)—In bloom along the shore near boat ramp. Balloon vine (Cardiospermum halicacabum)—Air-tight, inflated fruits about the size of golf balls that disperse by wind and water; in the mowed area the vines straggled over the ground, and the balloons popped underfoot. Coffee weed; hemp sesbania (Sesbania herbacea)—An extraordinary, annual, leguminous herb to as tall as 10-12 feet; invasive in low, open habitats; faux trees native to North America, not Wonderland; the roots are loaded with nodules of nitrogen-fixing bacteria. Cottonweed, plains (Froelichia floridana)—Tall, slender, and elegant native of the pigweed family; we saw this cottonweed last year in the Chidester sandhills. Cottonweed, slender (Froelichia gracilis)—Weedier, more spreading than the former; in the border of the parking lot. Frog fruit (Phyla nodiflora)—A ground-covering vine with small, pretty flowers. Golden-aster (Heterotheca subaxillaris)—A DYC (“durn yellow composite”) with a camphor-like smell; common, weedy, showy, native. Heliotrope, Indian or turnsole (Heliotropium indicum)—Supposedly from Brazil, so the “Indians” of the common name would be Native Americans, but now a worldwide weed of warm, wet habitats like sand, gravel, and mud bars, with blue flowers arranged in what used to be called a “scorpioid raceme” (because the cluster unrolls from the tip like a fern fiddlehead, suggesting a scorpion’s tail), but the terminology police raided the glossaries and replaced “scorpiod raceme” with the technically correcter “helicoid cyme;” large plants on the slope above the boat ramp were loaded with flowers, fruits, and butterflies. Hornpod or miterwort (Mitreola petiolata)—Formerly tracked by Natural Heritage but, according to Theo Witsell, found in abundance by Bill Shepherd along the Arkansas River and removed from list of tracked species; we found only two plants. Indigo, false or leadplant (Amorpha fruticosa)—Locally very common; one especially large shrub impressed the morning group even in fruit (rather than flower); Michael Dirr in Manual of Woody Landscape Plants says the species has been in cultivation since the 1700s and many horticultural forms are listed, but he has never seen one in gardens or nurseries. Lovegrass, red (Eragrostis secundiflora)—The leaves are blue-green, the spikelets reddish as they age; one of a group of deep sand plants on the hill above the river. Morning glory, ivyleaf (Ipomea hederacea)—With glorious blue, open corollas in the morning that faded to purplish in the afternoon; alien. Morning glory, whitestar (I. lacunosa)—The native Ipomea with smaller white flowers. Primrose-willow (Ludwigia leptocarpa & L. decurrens)—Yellow-flowered wetland plants of the evening-primrose family, but without the floral tube of the more upland and usually showier evening-primroses (Oenothera); it’s always fun to see two closely related species of the same genus side by side to compare similarities and differences. Purslane (Portulaca pilosa)—A native portulaca of sandy riparian areas; pretty magenta flowers observed in the morning but not in the afternoon. Rosemallow, crimsoneyed (Hibiscus moscheutos)—In fruit only. 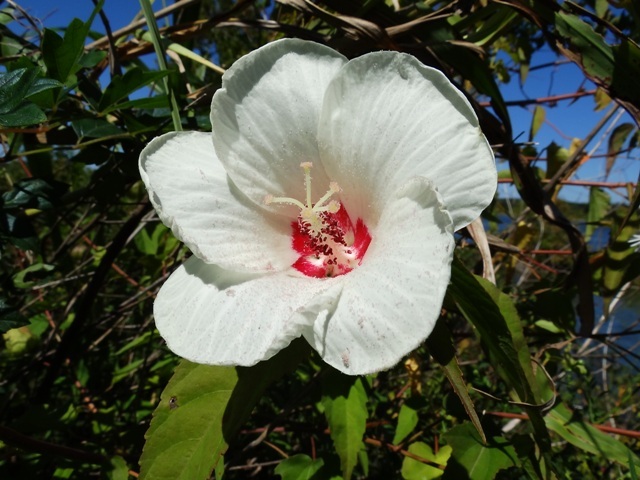 Rosemallow, halberdleaf (H. laevis)—In flower and fruit; our two common, native hibiscus bear some of our largest and showiest flowers. Sandbur (Cenchrus spinifex)—Ouch! Another deep sand cohort, with burs that are best removed from cuffs and shoelaces with pliers. Scratch-daisy (Croptilon divaricatum)— With cottonweed, sandbur, red lovegrass, and fall witchgrass in a sandy patch on hill; a sometimes delicate DYC. 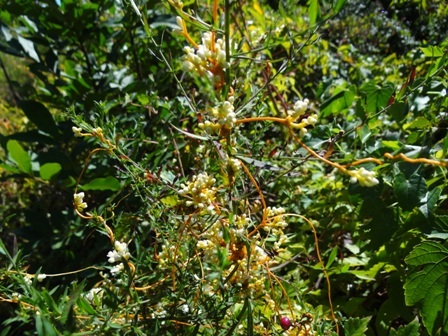 Sweetscent or stinkweed or camphor weed (Pluchea odorata)—A showy fall composite with purple heads in dense clusters. Toothcup (Ammania x coccinea)—Fruits and whole plants successively turning red; showy. Wild bean (Strophostyles helvula)—Twining vine with twisted keel and no doubt an interesting pollination biology: there must be a bug with twisted proboscis out there somewhere, no? Witchgrass, fall (Digitaria cognata, nee Leptoloma cognata)—Lovely, diffuse, reddish grass in sandy area with sandbur, red lovegrass, cottonweed, et al. ; now in the crabgrass genus, representing the triumph of DNA systematics over common sense taxonomy. As Sundell noted, Murray Park is an interesting mix of wet and dry sites. “The high water table along the river provides fall wildflowers with enough moisture to bloom through heat and drought.” Some locations in the park have deep river sand that supports very different drought-tolerant species and a riparian forest within the park “has large oaks, elms and cottonwoods, a near state-champion sassafras, and a grove of impressively large paw-paws.” A map of the park, which is located a short distance to the east from the new Two Rivers Park Bridge that leads to Two Rivers Park, and the surrounding area is available here. A selection of morning and afternoon hikes is a typical feature of the society’s biannual meetings. The next meeting will be May 4-6, 2012, in Jonesboro, Arkansas. This entry was posted in Field Trips and tagged Arkansas Native Plant Society, Eric Sundell, Murray Park. Bookmark the permalink.